Puerto Rico’s governor says farmers in the U.S. territory are once again cultivating sugarcane to help local distilleries produce rum as part of a $170 million project, the Associated Press reports. Gov. Alejandro Garcia Padilla said Wednesday that he expects up to 20,000 acres (8,000 hectares) to be cultivated by 2016, generating some 1,300 jobs. He said sugarcane will be grown in at least 10 municipalities in the island’s western region, the majority of it on private property. Garcia said he expects farmers to eventually produce some 800,000 tons (726,000 metric tons) of sugarcane, which will be turned into 20.5 million gallons (76 million liters) of molasses. He said an unidentified private company will operate a new sugarcane processing plant that is scheduled to be built later this year. Although the Associated Press reports does not identify any particular rum maker as spearheading the project, early this month the Puerto Rican press interviewed Roberto Serrallés of Destilería Serrallés, producers of DOn Q rum as being behind the project. 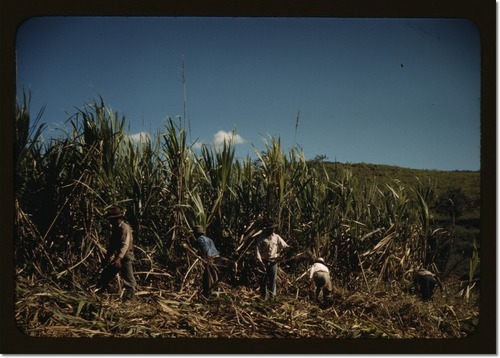 In an interview with El Nuevo Día, Serrallés spoke of the high cost of importing molasses and of new technologies that allowed sugar cane to be planted and harvested without the devastating labor input that made the industry the scourge of the Caribbean. Photograph by Jack Delano from the Library of Congress. Who is the “unidentified” private company? Why repeat the same mistake – monoculture that led to the destruction of vast amount of soils in PR – again? Why not grow food instead of stimulants? A country that imports 95% of its food, should make it a priority to strengthen its local small and medium sized farms by helping them to get the required highly diversified germplasm. Instead, it caters to the corporate, greedy agribusiness industry because it gives them millions of $$ in bribe money. Strengthening the local agriculture could give work to over 100,000 people and it would simultaneously make the island at least 80% food self-sufficient. Growing sugarcane would ruin more soils, attract more pests and diseases, and ultimately not benefit anyone….except for rum addicted alcoholics.